Most business persons and businesses understand the concept of strategic alliances. The reason to form alliances are many and varied and include such reasons like; monetary, distribution, market access, shared technology and others. My reason for joining Berteig Consulting is a little unusual. First reason is that I am an international consultant, trainer and coach. My international work requires 100-150 days of travel outside North America every year. I have been doing this for 10 years and it does not hold the same appeal it did in the beginning of the travel. Don’t misunderstand me, I still like the travel but I pay a price physically. So joining a reputable and successful Canadian company was appealing to me. My second reason for the alliance is that I am very impressed with the knowledge, skills, abilities and professionalism that exists in the Berteig Consulting team. Their values were consistent with mine. 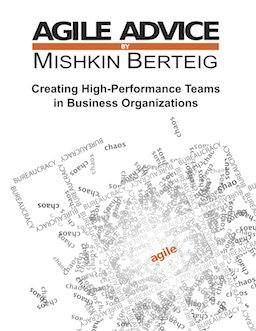 During the summer of 2008, Mishkin Berteig (the co-founder of the Berteig Consulting) and I began to investigate how we could work together. Needless to say we hit it off. There is mutual respect. So I made the move to become a CSM and begin to train, coach and consult within his company. Mishkin and I have already decided to co-write a book about Agile. I have currently written 5 books which are published in 10 languages, one of which is a best seller. Mishkin and I hope to publish in late 2009. I will continue my international work to some degree, but my strategic relationship with Berteig Consuting will become more important in the coming months and years. I look forward to adding value to Berteig Consulting, the team members and all of our clients. I will do what needs to be done to insure the existing and future customers receive the best advice, coaching and training available in the Agile marketplace. I care about the people at Berteig Consulting and will make sure they receive value from me. There is a quote I respect … People don’t care how much you know until they know how much you care! We at Berteig Consulting care about the quality of our interactions with our customers and the results of our efforts.